I lived for a year in Japan. No, it’s not where I served a Mormon mission. I did that in Brazil. Upon graduating from BYU I took a job teaching English in Japan for a year. It was a wonderful time in my life and my heart was devastated upon learning of the recent tragedy there. Fortunately, the area where I lived and worked was outside the area of devastation and I don’t know anyone killed or wounded. While my time in Japan preceded my eventual exit from Mormonism, I do believe it was some of the lessons I learned there that helped me a decade later. The one friend in Japan with whom I still communicate is a Japanese-Brazilian. Yes, she looks Japanese but grew up in Brazil so her culture and mannerisms are more Brazilian. She is married to another nisei and raising her family in Japan. Of course there’s a Mormon connection to our meeting. Apparently early in the 20th century a large number of Japanese folks made their way to Brazil to work on the coffee plantations there. In fact the largest number of Japanese outside Japan actually live in Brazil. In the late 1980’s many of the descendants of the Japanese began to find their way back to Japan and by the time I got there there was a sizable population in the very area I unknowingly went to live. Most of them couldn’t speak Japanese and so they were as “gaijin” as I was. So on that particular Sunday when I turned and introduced myself in Portuguese the Brazilians and I became instant friends. For the next year our little band of “gaijin” were inseparable. Our lives were experienced in Japanese which was then translated to me in English; whereupon I transferred the information into Portuguese. Sometimes our real life game of telephone traveled in the opposite direction but I was always in the middle. 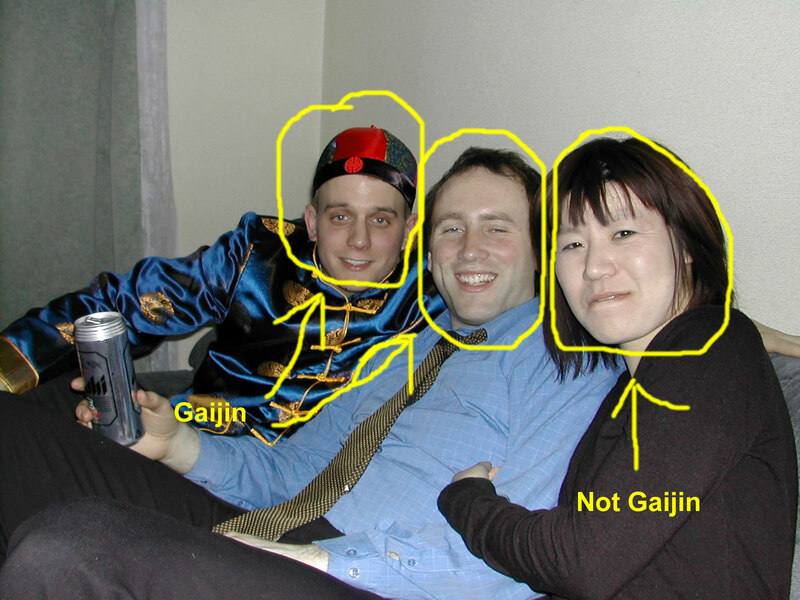 These were my Mormon “gaijin” friends on the weekends. During the week, my work colleagues, my gym friends and neighbors were full-blooded Japanese. To them I was an oddity and that fact stemmed as much from being Mormon as it did from being American. The general consensus was confusion that an intelligent, kind person could believe in a god let alone the Christian one. My predecessor at the school had been a “born again”christian from the mid-west who had similarly baffled the local folks. As they bombarded me with questions to explain her previous and supposedly christian behavior as well as my own Mormon-ish stuff, they indicated politely that my version of god seemed only slightly less implausible. Japanese business practices are held up as models of consensus and collaborative groups. But my experience working there showed me another side to that coin. At the school where I worked decisions were always brought up for group discussion. The impression is that everyone has a voice but nothing could be further from the truth. More often than not, the leadership had already made their decision and this exercise was merely a tool to arm-wrestle everyone into agreeing (kind of like the sustaining of church callings that goes on at Sacrament Meeting each Sunday). I witnessed kindness, honesty and respect among avowed atheists. Outside the Mormon ward I attended everyone else I knew were comfortably atheists. I was welcomed into people’s homes, shown kindness and saw generous acts of courtesy among each other. I was once on a tourist bus that was flagged down by a taxi driver who had one of our passenger’s purse. He went to extreme efforts to chase us down and return it – something westerners would lazily classify as a “christian act”. I was amazed when I learned the Japanese perspective on Pearl Harbor. During class discussions, my students were innocently and naively confused at the kind of human aggression that would lead to a decision to bomb like we did in Hiroshima and Nagasaki. They’d never heard of Pearl Harbor. Seriously! It certainly softened the blow for me when I later learned that I’d never heard of such Mormon things as The Kinderhook Plates, Book of Abraham problems, the stone in a hat “translation” of the Book of Mormon and the fact that there’s not a single shred of scientific evidence for anything described in the Book of Mormon, but there’s plenty of evidence that questions it. An ignorant following really isn’t hard to achieve. My English lessons were often social discussions in the context of a conversation class. Almost invariably my young students bristled against the constraints of the controlling culture and some even rebelled. But by the time anyone I knew reached adulthood they became an active participant of the prevailing culture rather than the mavericks they swore they’d be. Watching this phenomenon reminds me of the numerous family and friends who choose to stick with Mormonism, their prevailing culture, no questions asked regardless of any facts or experiences they might pass through. Leaving the culture of your birth is just too hard and too stressful that people rarely do it. When you are thrown into such a foreign culture you want to understand it at every level. At least I did. I tend to be a very inquisitive person anyway, but in Japan that was only tolerated so much.I know my boss tired of all my inquiries quite early on as they were seen as questioning her authority. Later that same intolerance for questions and thinking outside the predetermined box led to the demise of my marriage. My ex wife never questioned. Later on I was corrected because I wasn’t aware of the custom of switching slippers at the door to the bathroom. You don’t wear your regular slippers in the bathroom. You transfer into bathroom slippers. Who knew? The next day I became the laughing stock of the school when I carefully remembered to switch into the bathroom slippers… but forgot to switch back and ended up cluelessly walking all over the school with the plastic toilet slippers on. 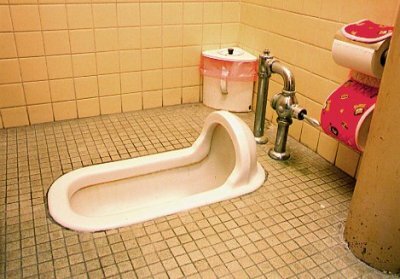 I did not have the instruction panel so I was, on the day that I wasn’t feeling great and was desparate when I reached the park type restroom at the Meiji Shingo, in too much of a hurry to study the possibilities and ended up facing the “wrong” way. So I wasn’t the only one who needed a little steadying in that position! Excuse me I’m not a a great author or an intellectual. But on my innocent search looking for personal views about teaching in Japan I came across your sordid post. What the hell is this post designed to do? Talk about your experiences in Japan or spread your bitterness against a good church? Seriously, I can’t get through a whole paragraph in this thing without some slighting comment about how you’re no longer a Mormon or how blind they are as a people. Your constant use of the term “Momon” or “Mormonism” without the respectful proper name of “Latter Day Saint” or LDS repeatedly demonstrates your irritating and needless contempt. It’s distasteful and childish and I have to admit I almost couldn’t even finish the entire thing because of my disgust. It’s as though you had never experienced life outside your comfy religious zone or never faced people of a different perspective before that shocked you off your shallow rooted upbringing. Don’t blame the Mormon people to justify your ill founded slights to a people who have done nothing but good for you. You wouldn’t do disrespect to the Jewish or Muslim people so. And the only paragraph free from your slams is the one about how to properly defecate in which you find hilarious. You can excuse yourself every which way and I’m sure you already have or you wouldn’t feel free to submit this kind of discourteous prattle, but If I were you, I’d examine what kind of mistakes I’d made in my own life that would drive me to excuse insulting a beautiful religion that has brought many people to fulfilling happy and real lives closer to God that I assume you have been in a long time. I just replied to your comment as a full-blown post to my blog. You can read it if you find “A Religious Fanatic Comments” which I posted tonight. Thanks for stopping by and getting all hot and bothered. It’s stuff like this that reminds me why I’d never go back. Yikes. That toilet frightens me. Great post. 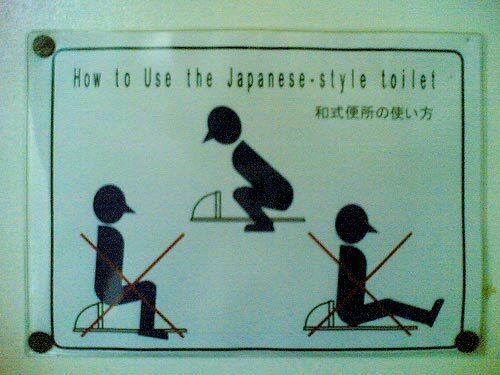 hehehe – all I can picture is the “how-to use the japanese toilet” sign.